Can Acupuncture for Stroke Recovery Help You? Acupuncture for stroke recovery has some surprising benefits. In this article, you’ll learn how acupuncture might be able to help improve movement and sensation after stroke. Let’s start by describing exactly what acupuncture involves. What Is Acupuncture for Stroke Recovery? The practice of acupuncture originated over 2,500 years ago in China as part of Traditional Chinese Medicine, which involves a mind/body approach to healthcare. Here in the west, alternative treatments like acupuncture are often used in conjunction with modern approaches. During an acupuncture session, a practitioner will examine and assess your condition, and then insert thin, sterile needles into your skin. Sometimes these needles are heated or stimulated with electricity after insertion. The general consensus is that acupuncture does not hurt, but you can feel the sensation when the needle first goes in. Does Acupuncture Have a Place in Stroke Recovery? The goal of stroke rehabilitation is to heal the brain through neuroplasticity, the mechanism that your brain uses to rewire and heal itself. Neuroplasticity is activated by repetitive practice and stimulation, like electrical stimulation. Neuroplasticity is engaged to the max when you can combine extra stimulation with repetitive practice. Because acupuncture sometimes involves electrical stimulation, it makes a lot of sense why some stroke patients have success with it. The extra stimulation from acupuncture can give your brain’s rewiring process a boost. How Can Acupuncture Help with Movement Improvement? If you’re trying to improve movement after stroke, then acupuncture might be able to help. Like all treatments for stroke recovery, acupuncture works best when used alongside an exercise regimen that gets your body moving and brain rewiring. Some of the studies on acupuncture for stroke (which we will analyze later), have shown that stroke patients who participate in both acupuncture and rehabilitation exercises see significantly better results than those who just do rehab exercises alone. A less-studied aspect of acupuncture is whether or not it can help with sensory reeducation after stroke. Sensory reeducation is important for individuals who have trouble with numbness, pins and needles sensations, and pain. 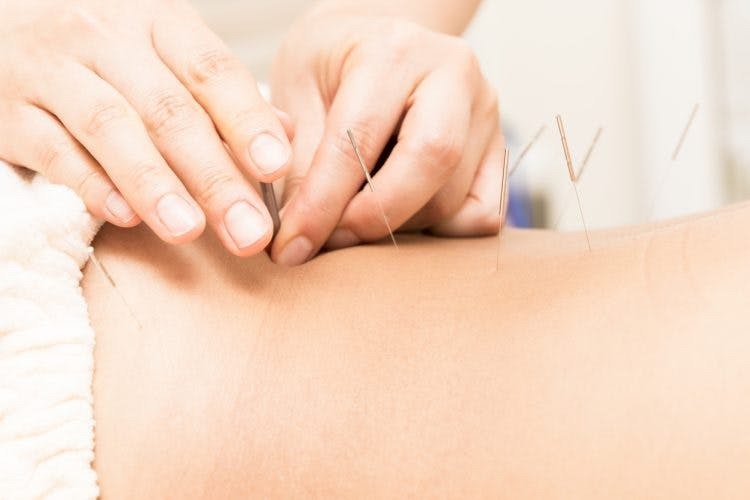 Some stroke patients have reported that acupuncture helped improve their senses, but those are just personal accounts that we’ve heard through the grapevine. So, why are we mentioning it if there aren’t any scientific studies to back it up? Because if you’re desperate for a solution, it could be worth a try. There are plenty of studies on acupuncture for movement improvement after stroke. Most of them offer conflicting results. For example, this study concluded that the positive effects of acupuncture for stroke recovery was just a placebo effect, and this study claims that there is zero effect. On the other hand, this study proved that acupuncture is effective for treating post stroke shoulder pain. Then this study showed that doing both acupuncture and rehabilitation exercises produces significantly greater results than just rehabilitation exercises alone – both during the study and at a year follow up. Overall, there are a ton of studies and they all have mixed results. So what should you do? Acupuncture for Stroke: What Should You Do? If you have a pacemaker, DO NOT try acupuncture because there might be electrical stimulation. Otherwise, acupuncture is a relatively safe practice. After all, if WebMD says it’s safe, then it’s official, right? So, if you’re anxious for a way to boost movement improvement or sensory reeducation, why not give it a shot? The studies are conflicting likely because everyone responds to acupuncture differently. We have heard from patients who saw zero results with acupuncture and patients who said that acupuncture was the game-changer! You won’t know how it will affect you until you try. To find your acupuncturist, hop onto Yelp and search for good acupuncturists in your area. Bonus step: Call and ask if they have experience treating stroke patients. Have you tried acupuncture for stroke? Share your experience with us in the comments below!